There are many good musicals in cinema. But those who really can translate music into scenes – not only by magnificent choreography or sets like Baz Luhrmann’s or Rob Marshall’s or the use of pop-culture reference ala Cameron Crowe, but exploring more than that. 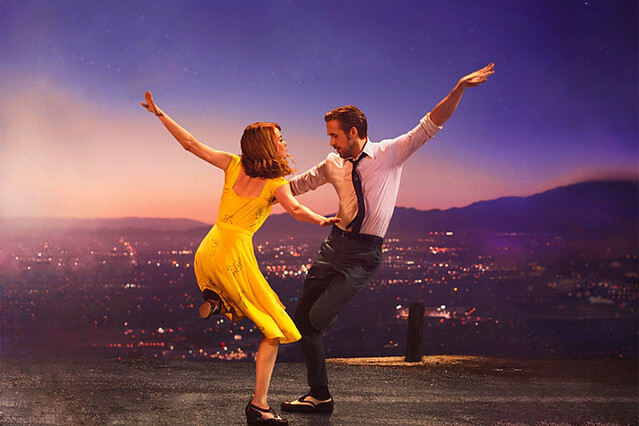 In addition to John Carney’s masterpieces like “Once”, “Begin Again” and “Sing Street”, Damien Chazelle treads this realm triumphantly in “LA LA LAND” following his awesome work on “Whiplash” last year. If Carney highlights the atmosphere of 80’s pop with pop culture elements – from music to movies in his “Sing Street”, Chazelle prioritizes the genre he had started in “Whiplash”: Jazz. What’s interesting is, this time this genre is transformed into the ambience of Hollywood’s golden musical era . Just when we thought we could not get something like “Singin’ in the Rain”, “An American in Paris”, “The Band Wagon” and the modern-day Euro-tribute to them in Jacques Demy’s “The Umbrella of Cherbourg”, “La La Land” appears as a musical presentation that is so perfect – which not only reached the critically acclamied status, also triumphed in many awarding events, including a clean sweep record of seven nominations at the Golden Globe plus 14 nominated category in the upcoming Oscars. One of the most powerful ammunitions exists in the composition Chazelle cooked with his Harvard colleague Justin Hurwitz who is also behind the dynamics of jazz in the “Whiplash”. But on the top surface, the duo Ryan Gosling and Emma Stone are the main commmodities who actually worked perfectly well, both in acting and chemistry. 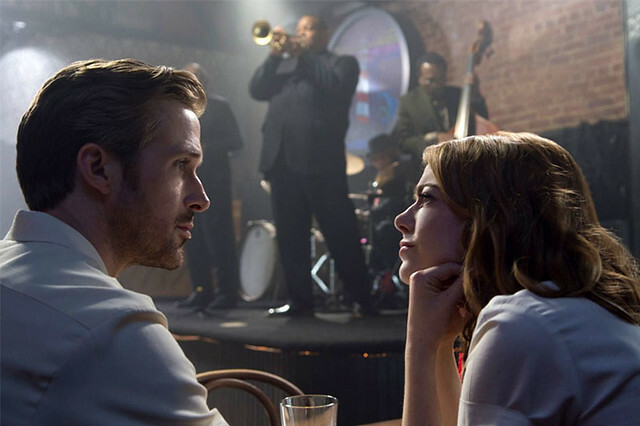 Opens with a musical scene in crowded LA highway , “La La Land” leads us to a cute-meet between Mia (Emma Stone) – an aspiring actress who is busy pursuing her career through various auditions while working as a barista -, with Sebastian ‘Seb’ (Ryan Gosling ), an idealistic jazz pianist and purist who dreams to have his own club. The story evolved into a serious relationship after Mia left Greg (Finn Wittrock). They both pursued their dreams among the bustle of Hollywood that was apparently not as good as it seems. 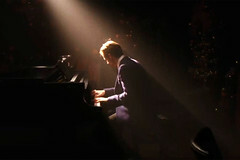 Seb began to get busy with his music career as a keyboardist in the band belongs to his school friends – Keith (played by John Legend) and forced to lose his idealism to jazz standards. Meanwhile Mia turned into a stage drama writer. Three seasons changed, fate brought Seb and Mia oscillated between two tough choices. But life goes on, and the dream lives on . It’s hard to imagine how Damien Chazelle , at his age that is just turned 31, could create a grand musical masterpiece as magical as this. 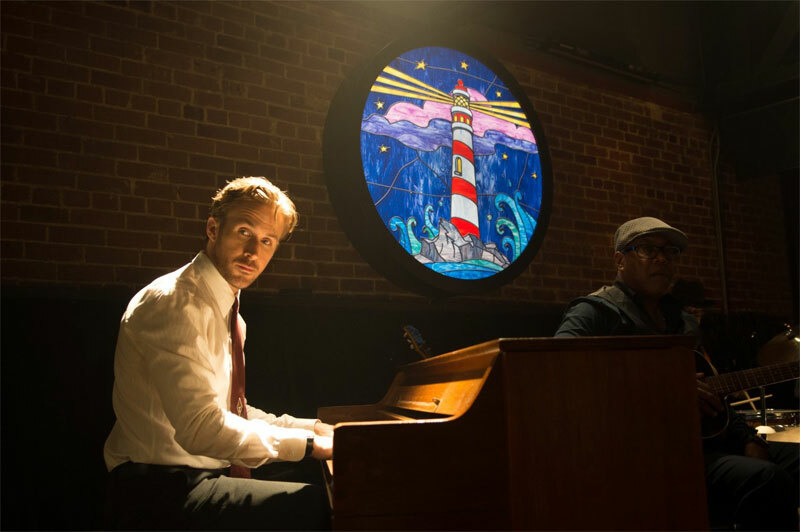 Based on his own dreams, the script of “La La Land” was written six years ago while pursuing his Hollywood career – long way from his studies at Harvard, existed as a jazz drummer and made independent films with Hurwitz over the influences of 20’s traditional city symphony musicals. All have made him a musical maestro. Let’s not forget his other works as writer/co-writer in different genres, from “The Last Exorcism 2”, “Grand Piano” and “10 Cloverfield Lane” which are not bad at all, as well. But “La La Land” is not a mere tribute to just all that. Built within a distinctive touch, the movie is set in the current era but shaped inside such imaginary walls which takes us to a time-traveling journey into Hollywood’s Golden Era. From the musical ambience and atmospheric 20’s – 40’s jazz standards to the golden era of Hollywood’s musical movies in the 50’s, from the details of design in artistic production which is credited to Linus Sandgren’s cinematography (“American Hustle”), the award winning editor Tom Cross (“Whiplash”) that synergized perfectly with the Chazelle’s style of translating music onscreen to amazing choreography of Mandy Moore which is creating a rich and vibrant color pallettes, “La La Land” was simply built over a majestic concept that gives us a stunning cinematic experience. The movie is even presented in Cinemascope. We might never imagined something musical could be created as beautiful as this. Even without rich sets and costumes like a Luhrmann’s musicals , sometimes even extraordinary minimalist, Chazelle not only successfully combined his classical and modern world, but also the dreams and realities that shape the characters along with their background and motives through one alternate universe of Tinseltown aka the glamorous world of Hollywood. Speaking of the script, it was busy tucking a rich references like a comprehensive jazz bible with all the history from Kenny Clarke, Thelenious Monk and Charlie Parker’s era up to the invasion of the elements of modern subgenres: from smooth jazz to the westcoast radio culture, from RnB influences to the use of drum loops, electronic elements and more, including some inserts of 80’s pop-culture/new wave such as A-ha’s “Take on Me” and A Flock of Seagulls’ “I Ran” as an important comparison in terms of composition. There is an emphasis of idealism in covering the main essence of love and the pursuit of dreams in the core of its characters; all presented with enormous heartfelt and full of charm that brought us into the world Mia and Seb. Playing Mia and Seb, Stone and Gosling perfectly transformed into real-life character, like a natural born singer , musician – also dancer. Plus with acting bravura and wonderful chemistry that previously glimpsed in “Crazy Stupid Love” but goes way much deeper. Bringing musical acts of his own, “La La Land” is probably not as magnitude without their strong appearance. The interaction and chemistry they shared can become a strong study of characters too. There are great supports from John Legend, Finn Wittrock , Rosemarie DeWitt and Tom Everett Scott (“That Thing You Do!”). And of course, Chazelle’s man-muse , JK Simmons , who reach the top of his career and acting exploration through “Whiplash” gave a memorable cameo. A lovely ‘jazz’ moment took place when Seb tried to explain jazz to Mia as they watched a band played in a club. He explained how jazz works among players. When the musicians works collectively and when they got the chance to bring in their own ideas in solo runs. “It’s conflict and it’s compromise, and it’s very, very exciting”. He reminds us the exciting essences of jazz in simple words, how jazz is never played the same twice and a simple guidance on how to love jazz. Also in the movie, John Legend made a debatable (or for some might be controversy) statement, “How are you gonna be a revolutionary if you’re such a traditionalist?” . Yes, it’s debatable, and we are not against any side. We also don’t want to fall down into the issues of race like some netizens bring. Everyone could have their own opinion or point of view, but for us, this movie gives an excellent portrait of reality regarding how struggling jazz musicians, actress and maybe idealists in other fields really are today in every corner of the world. Some have to sacrifice their idealism, but the question is, how much? How far can one go, what do we decide, what are we going to do and what do we choose in every step in order to make our dreams come true? How much effort should we do, how many sacrifice we have to give, how far should ‘dance’ in between dream and reality? What should we do in times of struggle, not only career-wise speaking but also in love-matter subjects. This movie left some points to think of, that we believe will stay long after we finish watching it. All leads to the bittersweet yet wonderful ending that further strengthens not only the formation of chemistry between Stone and Gosling but also a contemplation of dreams, love and choices we make in life. 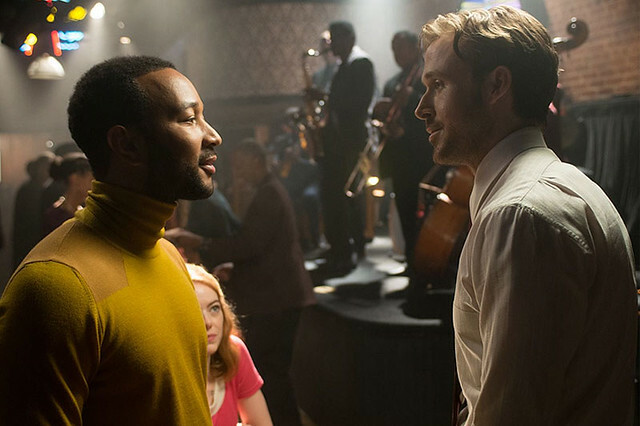 “La La Land” finds its best moment in every bar and move as beautiful as an epic symphony. From the gorgeous ‘one take’ opening “Another Day of the Sun” which successfully put us into the soul of this movie, “Someone in the Crowd”, “A Lovely Night”, the movie’s contemporary single “Start a Fire” by John Legend, the evergreen-to-be love theme “City of Stars”, “Mia and Sebastian’s Theme” to the scoring number “Epilogue”, all contributed big deal to make winning scenes. With magic defines in every inch of the movie, “La La Land” runs like a wonderful symphony to dance our hearts out . This movie makes us sitting in the theatre with rather mixed feelings – between sad, happy or even fascinated with all the extraordinary cinematic experience it offers. One of the movie’s best lyrics in the song called “The Fools who Dream” sung by Stone might be a good way to wrap it. “… here’s to the ones who dream, foolish as they may seem, here’s to the heart that ache, here’s to the mess we a make … “ . “La La Land” explains the true meaning of what ‘instant classic’ is about. We think it doesn’t need a test of time to make this movie be remembered as one of the best musical works ever made, and we won’t be surprised if many of you want to see it again and again. 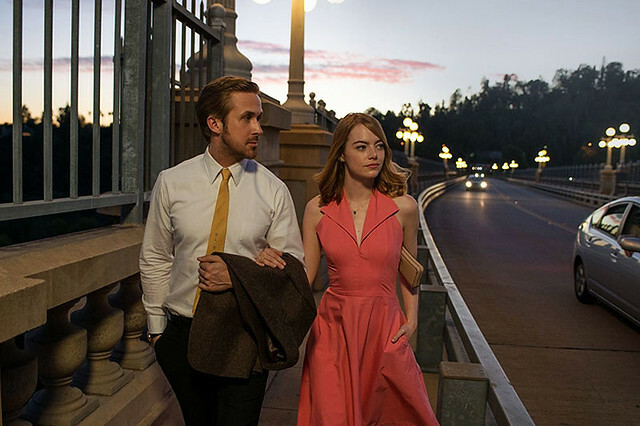 Ryan Gosling and Emma Stone should be listed as legendary pairing in musical films like Fred Astaire – Ginger Rogers and Gene Kelly – Debbie Reynolds. This movie puts jazz not just as the theme, but one of the main character. It’s portrait of the glamorous golden era of Hollywood, the blending between dream, fantasy and reality, the philosophical aspects, all made in awe-inspiring triumph. 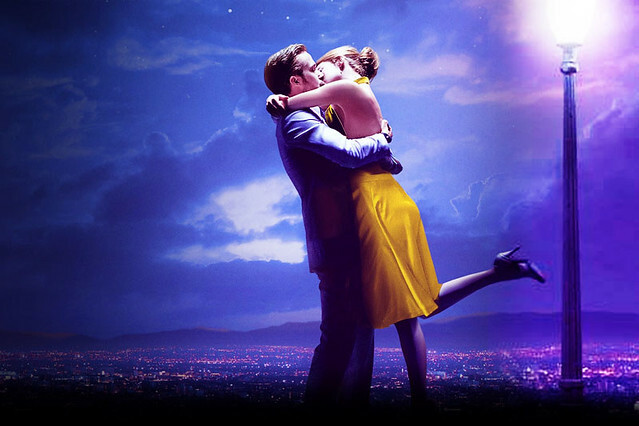 In short, La La Land is an irresistibly glorious and seductive love letter to Tinseltown, a homage to Jazz, a tribute to Love and Dreamers. What a feeling!